The LMT participated in the Event Horizon Telescope experiment to image the supermassive black hole at the centre of our Galaxy. May 2015 – The LMT has successfully participated in the Event Horizon Telescope observations. During the period 20-30 March 2015, the LMT participated in the Event Horizon Telescope (EHT) experiment to image the supermassive black hole at the centre of our Galaxy, and thereby improve our understanding of these exotic objects as well as test fundamental physics in an extreme gravitational field. The EHT is a network of the world´s major millimeter-wavelength telescopes, including the LMT, Atacama Large Millimeter Array (ALMA), South Pole Telescope, Atacama Pathfinder Experiment (APEX), James Clerk Maxwell Telescope (JCMT), Submillimeter Array (SMA), the California Array for Millimeter Astronomy (CARMA), Submillimeter Telescope (SMT), Institut Radioastronomie Millimétrique (IRAM) 30-m and Northern Extended Millimeter Array (NOEMA). During the recent EHT experiment a subset of these facilities (the LMT, JCMT, SMA, CARMA, SMT, and APEX) participated in simultaneous observations at 1.3mm towards the Galactic centre black hole. The recorded data were synchronised using hydrogen maser atomic clocks at each site, and stored on dedicated high-speed recorders. 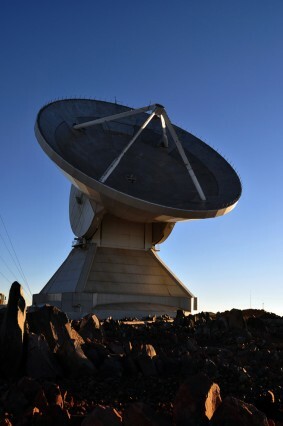 The hard-disks, with the recorded data from all the individual telescopes, were shipped to the Haystack Observatory for correlation and the initial stages of the data reduction. The on-going analysis has detected the first fringes at 1.3mm of the EHT 2015 campaign between the LMT and the JCMT over a baseline of approximately 6000 km. The detection of VLBI fringes at 1.3mm is another major milestone for the LMT, and represents the continued progress of the LMT to become a unique world-class astronomical facility.